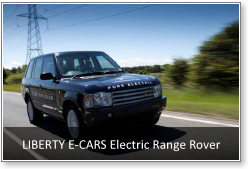 This Saturday 6th November sees the RAC's inaugural Brighton to London Future Car Challenge (BLFCC), for Electric, Hybrid and Low-Emission ICE vehicles to use the lowest energy on a 60 mile route from Madeira Drive, Brighton to Pall Mall & Regent Street, London. 10.30 - noon appear to be likely times for these cars to motor through Kennington Road. 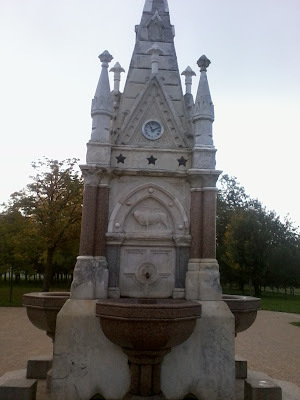 Sunday 7th sees the RAC's London to Brighton Veteran Car Run, in Kennington between 07.10 and 09.15. The annual event takes place on the first Sunday of every November and commemorates the Emancipation Run of 14 November 1896 which celebrated the passing into law of the Locomotives on the Highway Act, which raised the speed limit for 'light locomotives' from 4 mph to 14 mph and abolished the requirement for these vehicles to be preceded by a man on foot. It's fun looking at a few ancient or future cars. It's when you multiply up the numbers that it becomes apparent that congestion and huge environmental damage must result even if you make vehicles superficially greener - and yes, that is an electric Range Rover competing. In 2010 the Telegraph reported there are 31,035,791 cars on British roads, the first fall in numbers since the second world war. The RAC Foundation's director, Stephen Glaister, expressed surprise at the figures. “This is likely to be a blip rather than the start of a trend. The population is forecast to rocket by ten million in the next couple of decades and these people will need to get about," he said. "We know people are driving less on an individual basis, and lifestyle changes might mean more people working from home in the future, but with nine out of ten passenger journeys already being made on the roads population growth – and economic recovery – will almost inevitably mean more cars. He is wrong. The challenge is to reduce our car dependency and car ownership. Car clubs and hire, public transport, and amenities within active travel distance of people's houses are the sane option. Cyclists can join in the Veteran Car Run and Young Lewisham and Greenwich Cyclists have a group ride - Kennington residents can intersect with them at East Croydon. Too old to drive safely? Getting old presents many challenges. Hardest of all is the threat of losing your independence. And for most people in Britain, that means one thing - their car. But what happens when you worry you are too old to drive? How do you know it's time to stop? And how does a family deal with the problem if granny or granddad refuse to hang up their keys? Great to see a Hire Bike stand going in next to the Lilian Baylis Technology School. I trust the staff have plans to encourage pupils aged 14+ to take a Boris Bike between home and school. In fact, having a hire bike stand by the school should be an essential part of any local School Travel Plan. 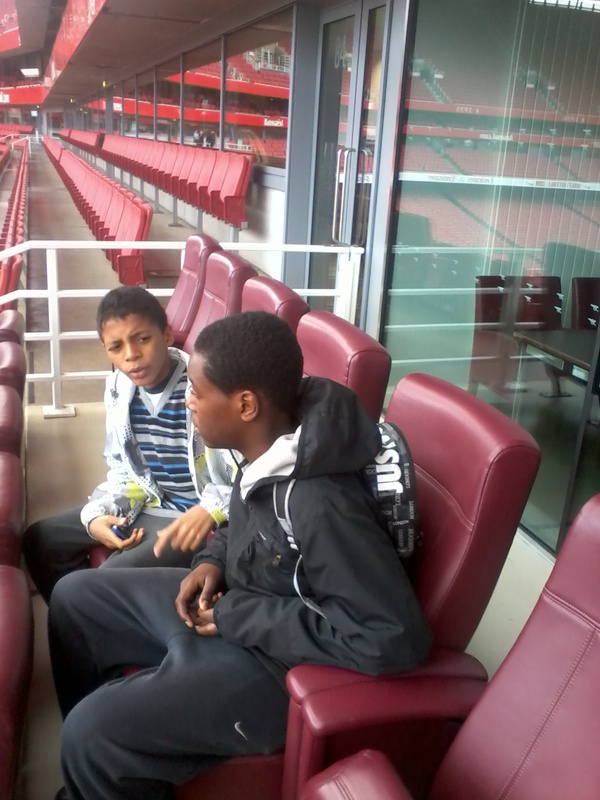 Fourteen Pedal Power Kennington Cyclists rode to Arsenal Emirates Stadium today to get a behind-the-scenes tour. Starting to cycle back we stumbled across Theo Walcott doing a photo-shoot in a phone box, and I failed to get a photo again. 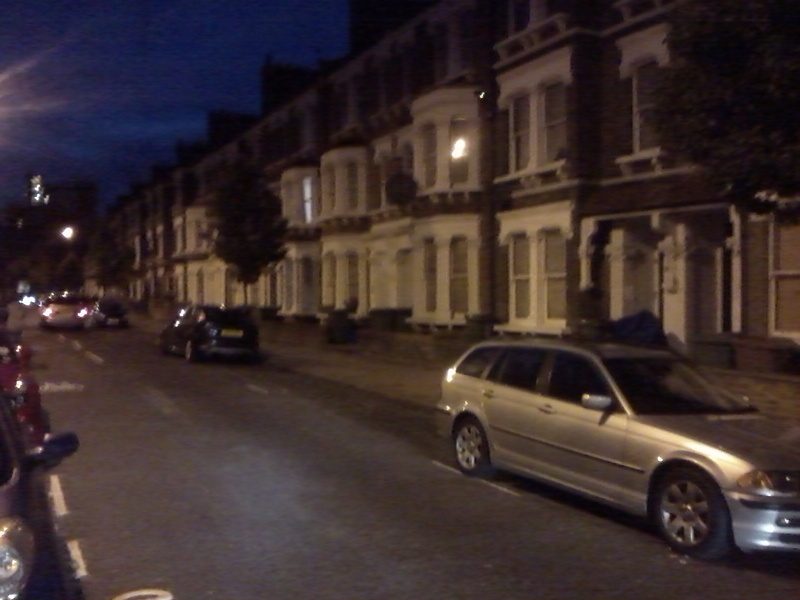 We arrived back in Kennington as dusk arrived after a really good day out. 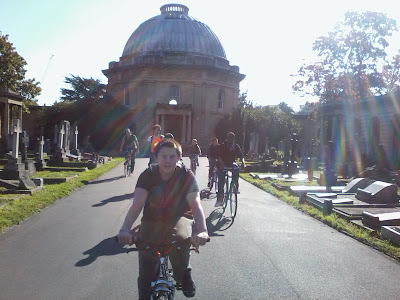 We had a couple of children who were under 10 with us and everyone managed to cycle the 12 miles comfortably as we took a leisurely pace and it wasn't too hilly. Those who were with us now know that it's easily doable - let's hope this rubs off on their mates who didn't come along this time. 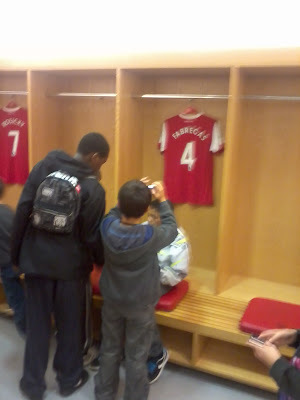 Thanks to Arsenal for giving us this tour free of charge and to Southwark's School Travel Plan Manager for negotiating that. 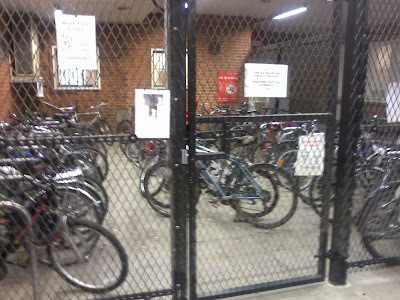 the bikes and where possible, seek to meet demand for bikes. progressed through the planning application process. I spent much of last week in Maida Vale, home of Stupid Urban Vehicles, attempting to encourage children to cycle on the road. 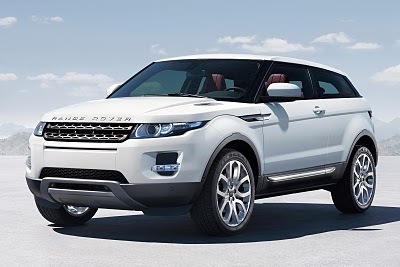 So I want to scream when I see a a promo video where the sad man in charge of Land Rover design talks about the 'design philosophy' of their new urban Rage Rover, the Evoque. He's clear that "People don't really need them but they want them" and says "I think this vehicle is going to transform our city landscape". "Its dynamic profile, with a dramatic rising beltline, muscular shoulders and a distinctive taper of the floating roofline, seems to draw the eye towards it, giving Range Rover Evoque a natural authority and magnetism." According to the site, "Your choices start with three main design themes"
A striking coupé-like exterior combined with elegant, uncluttered interiors in neutral colours showcases the pure, simple forms of the cabin architecture. Brushed aluminium trim contrasts with soft-touch wrapped materials. Smooth surfaces make it easy to wipe off the blood and gristle from a child cyclist you've crushed while doing the school run. The ultimate in Range Rover luxury, combining an enhanced exterior with unique 19 inch wheels and premium brightwork with a sumptuous interior almost entirely swathed in the finest leather, complemented by real wood and metal finishes. You can mow down over a whole family riding bikes and you won't feel a thing in your cocooned mansion car. A bold, dramatic exterior with 20 inch wheels, unique bumpers, sills, grille and tailpipes, which projects a more assertive, confident stance. Premium sports interiors with leather seats and unique sports detailing reinforces the dynamic design theme. The cheesegrater bumper and grills allow you to lacerate old ladies on bicycles and spew their diced entrails out of the exhaust. The website then drivels on about the sustainable materials used to build the tank. Carefully designed to maximise the use of more sustainable manufacturing materials, each vehicle uses 16kg of recycled plastic and 21kg of natural and renewable materials. Wow, whoopee, there's an achievement in a city runabout that's expected to weigh an eyewatering 1625kg plus. As I said in the title, this kind of urban shitemobile makes me want to Puque. Clearly I'd rather prospective purchasers bought bicycles instead - but failing that, the Citroen C1 is a much more reasonable urban car. 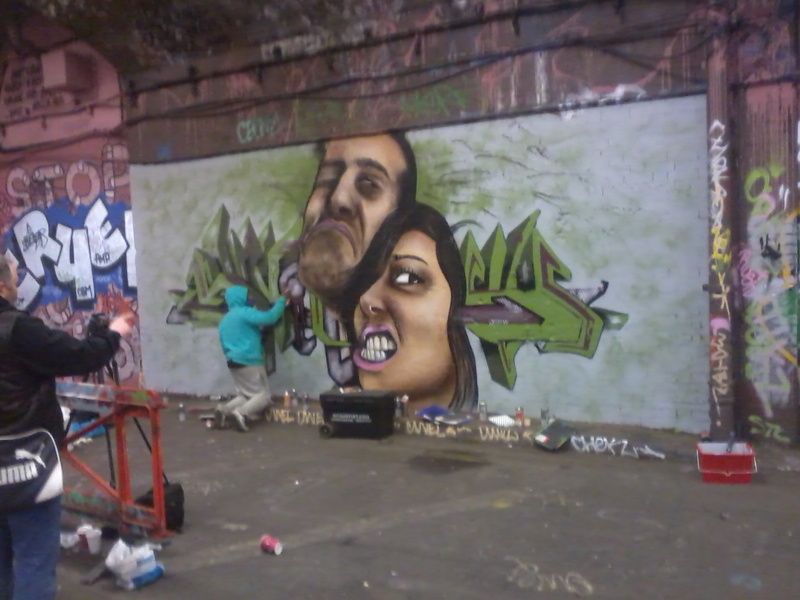 Waterloo Graffiti Tunnel (aka Leake Street) is a hive of artistic activity with the air heavy with the smell of spray paint. This legal, ever changing studio/gallery under Waterloo Station links Lower Marsh and York Road. It offers an alternative car-free route to the Westminster Bridge Road tunnel, albeit with a bit of pavement at the Lower Marsh end. 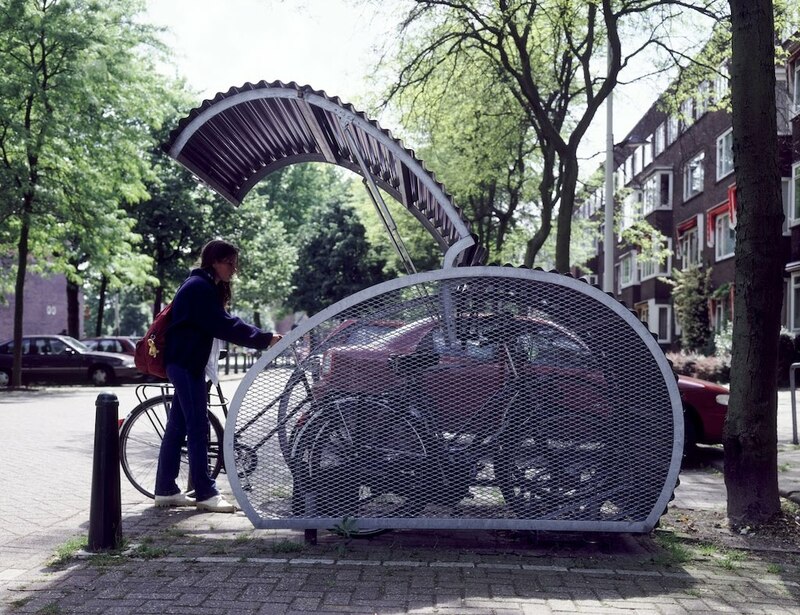 There's lively debate currently about whether more segregated cycling facilities are needed in the UK - cycle paths/lanes that are separate from those for pedestrians and motor vehicles - and how the cycle campaigning organisations view the subject. 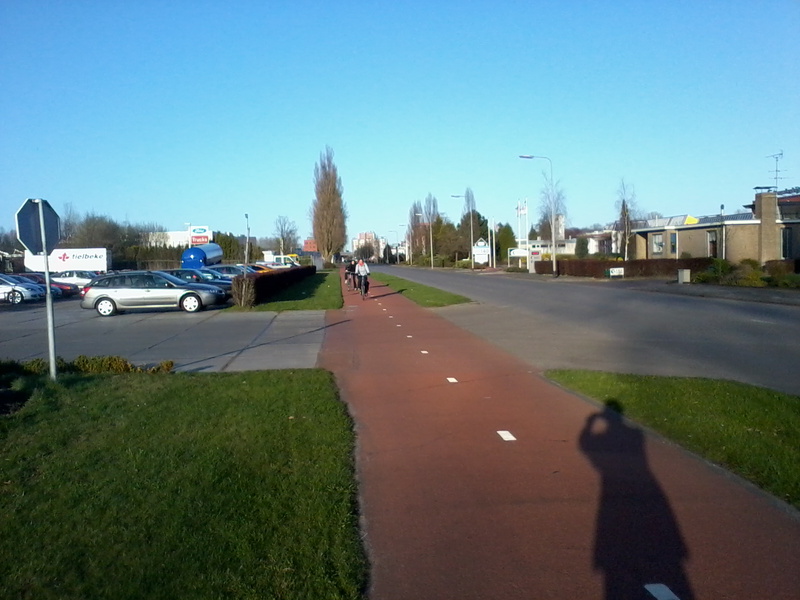 There's no doubt that more people would cycle if it was more pleasant (i.e. away from motor traffic) but only if it is also more direct and quicker than taking the car or bus, with as few needs to stop and restart as possible. Cyclists will, unsurprisingly, tend not to use a segregated lane if it requires giving way when cycling the same way on-road doesn't. In my view, segregated cycle facilities can only really succeed if we change the rules on prioritisation at junctions in the UK. Compare that with the Netherlands where the cyclist on the main road approaching a junction has priority over traffic wishing to turn off or onto the main road. Cyclists can continue at normal speed. Another example of the sort of change that the DfT would need to implement can be shown in Dutch roundabouts. 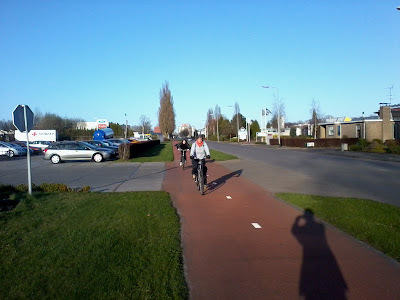 The cyclist only has to give way to / merge with cyclists as they enter the roundabout cycle lane - no jousting with cars. (The 'sharks teeth' are the give-way markings). 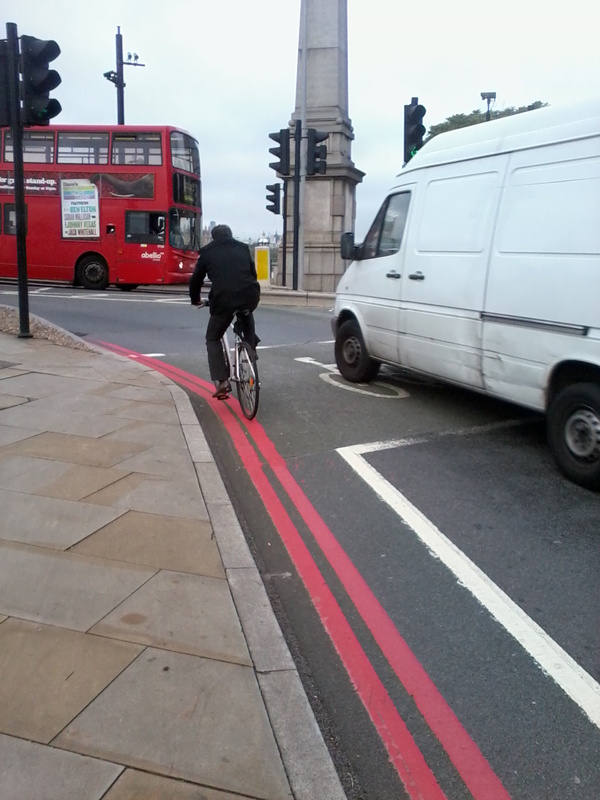 Motorists have to give way to cyclists on the cycle lane as they enter and also as they exit the roundabout. 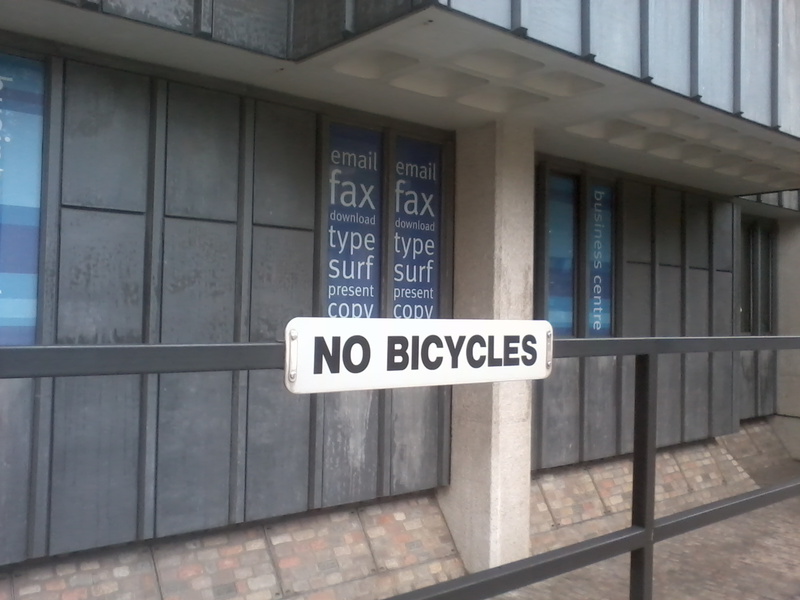 It's clear that the cyclists have the edge over motorists. 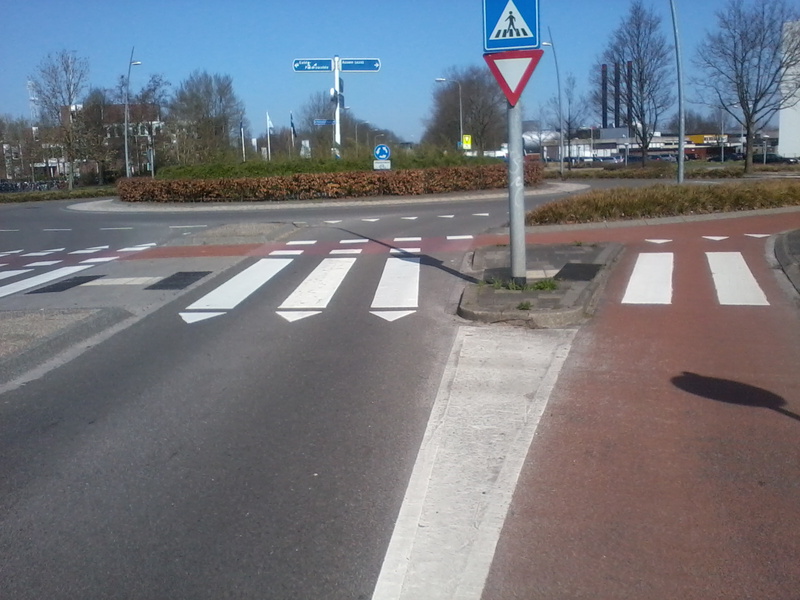 To make this kind of prioritisation work demands lower speeds by drivers, excellent training of road users, consistent road markings and good sight lines. Campaigners for segregated facilities need to start with getting the change in prioritisation through the DfT. I think this would be a great result. 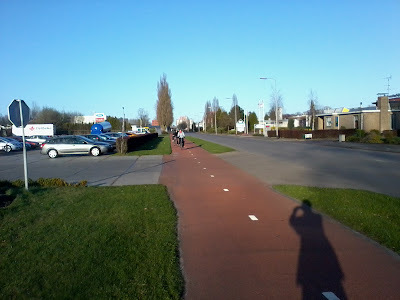 Meanwhile at a local level I'm going to keep badgering for lower speed limits; more direct routes for cyclists; and reducing the volume of motor traffic volume (e.g. 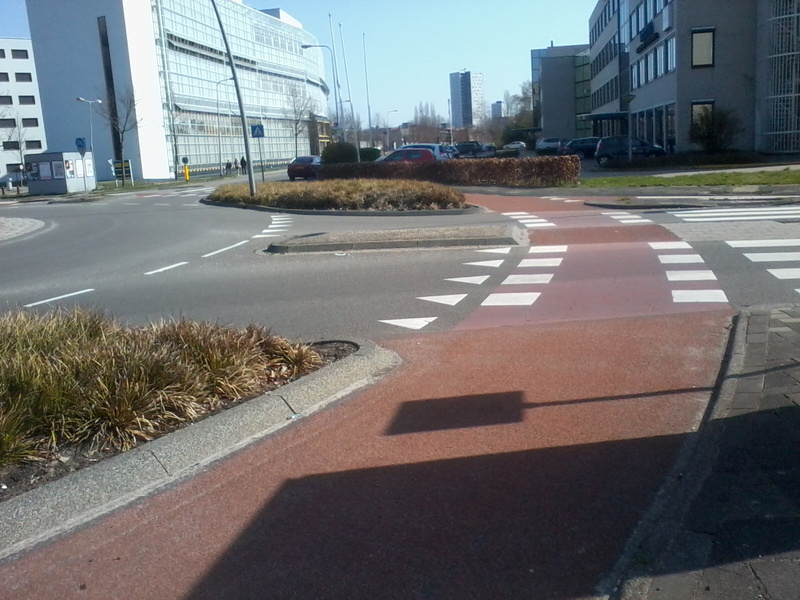 through making roads access only for cars, rather than a rat run). North London film maker Lee Butterley has beaten stiff competition to triumph in TfL's Cycle Revolution film competition. TfL teamed up with Film London and the Bicycle Film Festival to give film makers the opportunity to celebrate the spirit of cycling in London through film. Lee was named the winner by the Mayor's Transport Adviser, Kulveer Ranger, at a special event as part of the international Bicycle Film Festival on Saturday evening. His quirky short film, Simon and Simone, serves to remind us all that love can conquer all - with the help of the Mayor's flagship cycle hire scheme! Lee, from Kilburn, said: 'We wanted to make a film which was simple, engaging and also showed how useful and accessible the Cycle Hire scheme is. 'We recorded the film in one afternoon traversing London from the Barbican to the South Bank to try and get as many iconic locations in as possible. David Brown, Managing Director of Surface Transport at TfL, said: 'There was a real vibrancy to all the films that made the shortlist. 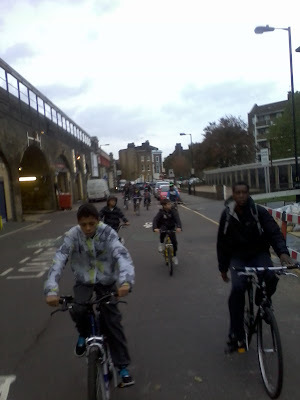 'They excellently demonstrate how liberating it can be to get on a bike in London. Labour's SE11 Action Team will be out on Brook Drive tomorrow, carrying out a survey on parking. 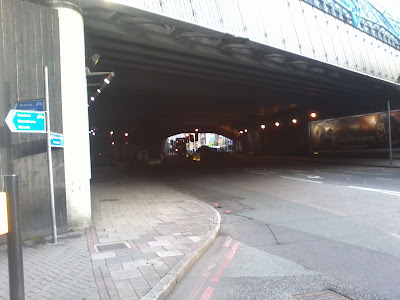 I did a quick survey this evening along this road (which in part is also Cycling Superhighway 7) and our Action Team are dead right to be concerned. After all, there is no parking save four spaces, and these are arguable as they're on Kennington Road at the junction of Brook Drive!!!! That's right, not a single Sheffield Stand on the whole street, never mind secure on-street parking cages of the kind that exists in Rotterdam and may shortly exist in Bonnington Square. Given that most of these houses have been split into flats there is clearly a need for secure on-street parking to avoid residents (and their visitors) having to lug their bikes up a flight or two of stairs into their flat to occupy the sitting room. You'd think that people could leave the bikes in the communal hallway and hope no-one nicks them. No way! I spoke to a resident this evening, just arriving home from work on his bike, and he told me that the council had been around recently and told them that they could not leave their bikes in the hall for reasons of Health and Safety. So, I'm very glad our local Labour team are asking people to fill in a parking questionnaire. I haven't seen it (just as I haven't seen one of our Councillors on a bicycle) and I trust that our elected representatives will have made sure that the survey isn't just about parking motor vehicles. 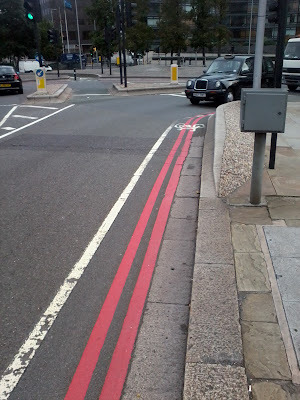 Juxon Street has become two way for cyclists creating a more direct route on a quiet back street to Lambeth Bridge rather than being forced to deviate via Sail Street. This kind of change is cheap to implement and allows people on bikes a quicker, more convenient journey - thus encouraging a switch from more polluting and congesting modes of travel. Cycle hire, car-free cycle route, lawns and trees, and even a modern, working water fountain. 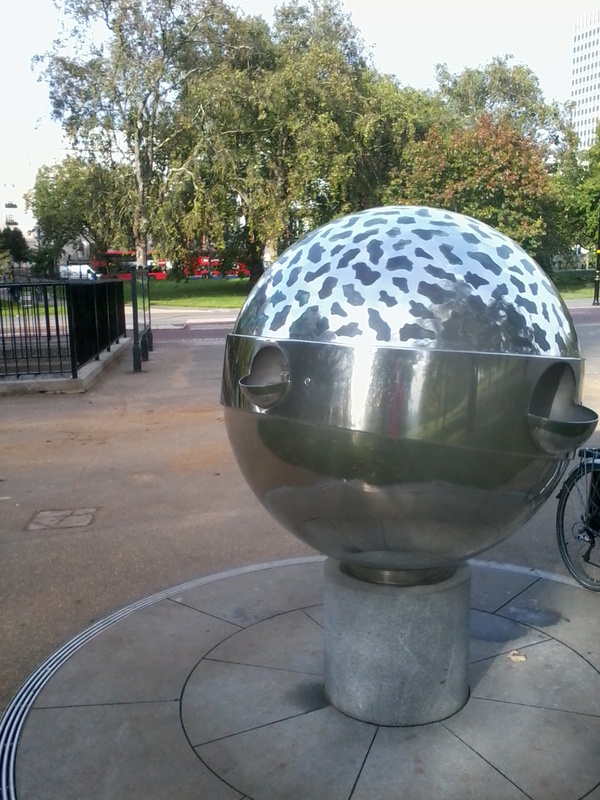 It's in Hyde Park at the top end of the cycle path that runs along Park Lane. Why only practically perfect? 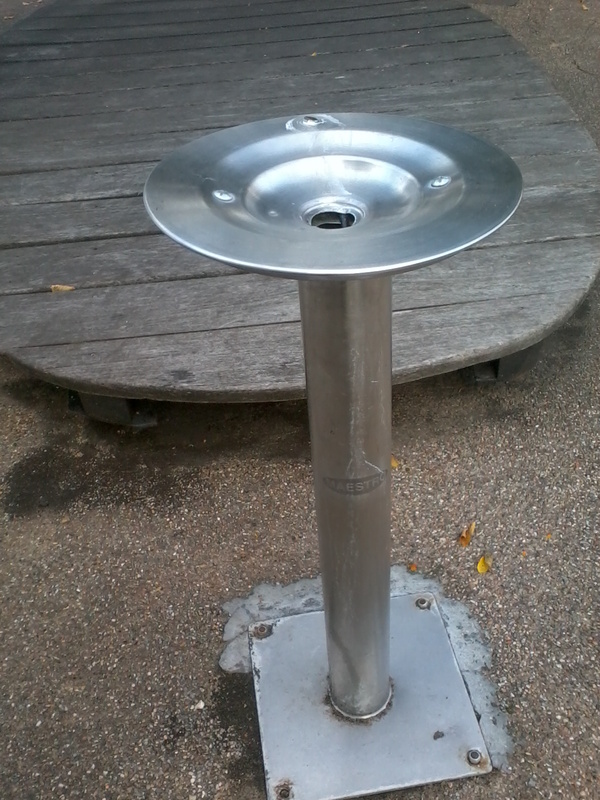 I didn't realise the sculpture was a water fountain! And, from checking for users over a few days as I pass, I suspect I'm not alone. 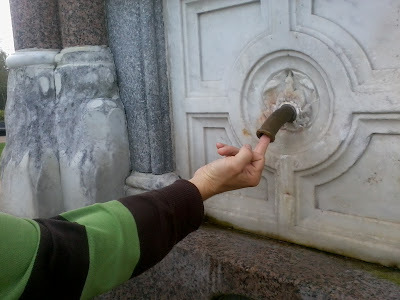 A great thing about the Royal Parks (I'm quite often cycling through Hyde Park and Regent's Park) is that their drinking fountains always seem to work. Okay, so you need to stick your finger up the spout of the one on Broad Walk in Regent's Park to make it work...but that's probably why the Parks have a competition to design a new 'standard' drinking fountain. 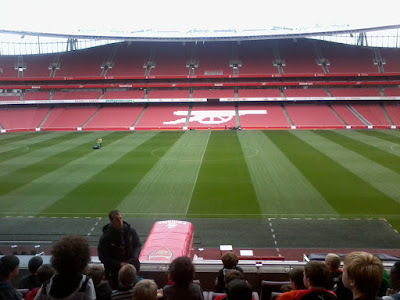 Let's hope the South Bank are paying attention. The chilly weather certainly impacted on attendance at Pedal Power Kennington's ride tonight with only three young riders (one of whom seemingly stayed warm throughout in shorts and t-shirt!). 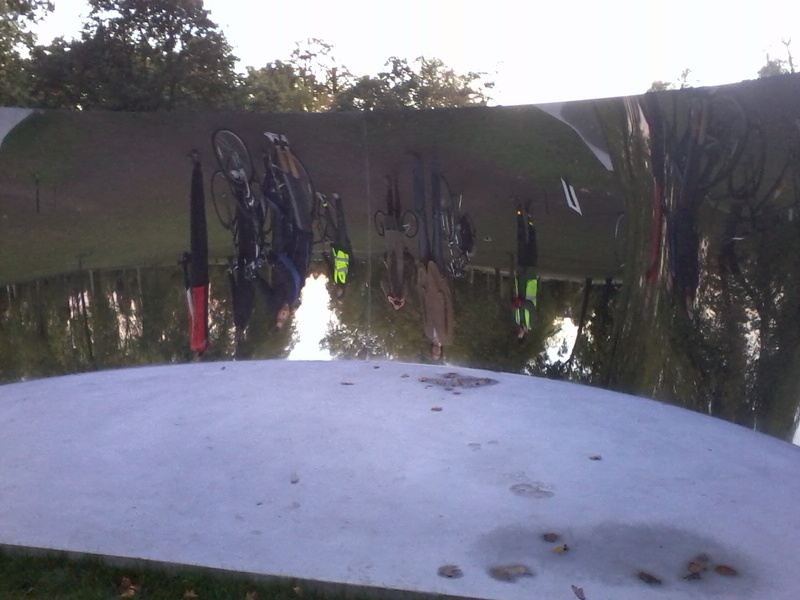 But what a good and fast ride we had, over Lambeth Bridge, through the magically hidden square that avoids Parliament Square, up past the Treasury and Pelicans, along the Mall past Clarence House with its mannequin soldiers outside, past Buck House along Green Park, under the Wellington Arch, through Hyde Park past the Serpentine and Serpentine Gallery Pavilion and then the world turned upside down with Anish Kapoor's help. Everyone enjoyed themselves - helped in huge measure by most of the route being off-road - and we were even back on time (despite opting for the horrific full on traffic around Parliament Square, followed by Westminster Bridge on the return journey to compare and contrast with our outward journey). The workshop this week was, as usual, packed and pretty chaotic with people desperately wanting help fitting a found derailleur, finding a rear wheel quick release skewer (only front wheel ones to be found), etc. etc. Some projects were started, some were finished. Most made progress but not enough for the bike to be ridden home that evening, with ensuing frustration - it takes experience to learn that fixing things takes time. traffic diverted via Waterloo Road, St George's Circus and Blackfriars Road. Two-way traffic is due to be reinstated in early April 2011. It'll be interesting to see whether this impacts on Belvedere Road motor traffic volumes and cycling. 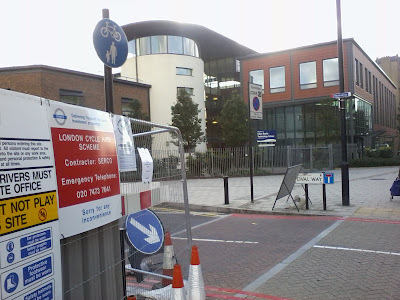 Will it help encourage pupils to cycle to London Nautical School on Stamford Street? Tufton Street, by Westminster Magistrates Court, always has a selection of Serco vans (presumably used to transport criminals who have not paid their parking fines) parked on the yellow line when I pass. The warden I spoke to told me he couldn't give them tickets. Latert this month there'll be the chance to comment on the future of parking in congested Westminster via a questionnaire. I wonder whether it'll feature cycle parking? I'm also interested to find out whether the 'need' for parking is one of the reasons for so many wide streets being one-way, rather than two-way at least for cyclists. 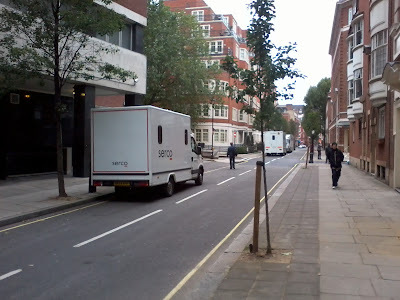 Also, certain streets in Westminster could usefully be made largely motor-vehicle free save deliveries at specified times of day (bits of Soho for example) - another aspect of parking review. 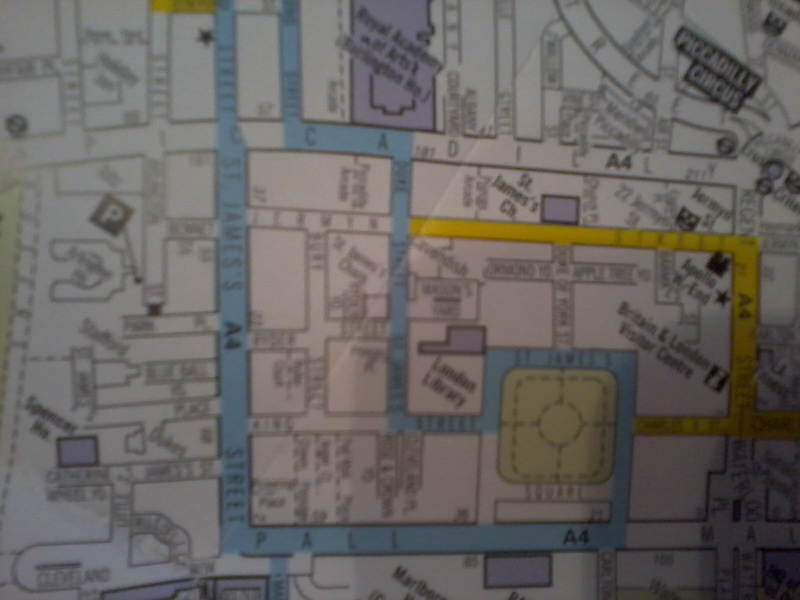 the future of parking policy by taking part in a wide-ranging review. policies for Westminster for the next 15-20 years. •travelling and parking in the West End. questionnaire will be available to download online from this website. 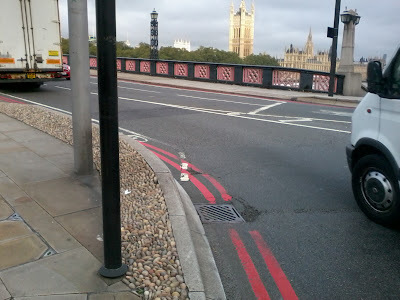 There is a cycle lane (above) along the Albert Embankment on the approach to Lambeth Bridge. 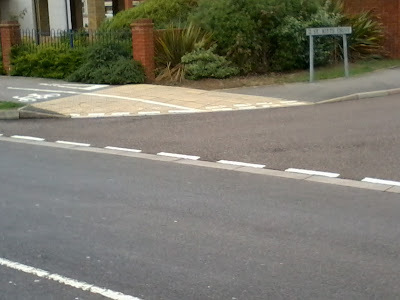 Although well below the recommended width, it's inviting to cyclists - after all it's been designed for their benefit and has a solid white line along the edge meaning motor vehicles aren't allowed in it. A further inducement to use it is that the criminally narrow cycle lane (that motor vehicles aren't allowed in) conveniently continues over Lambeth Bridge towards Westminster (below, looking towards Lambeth). 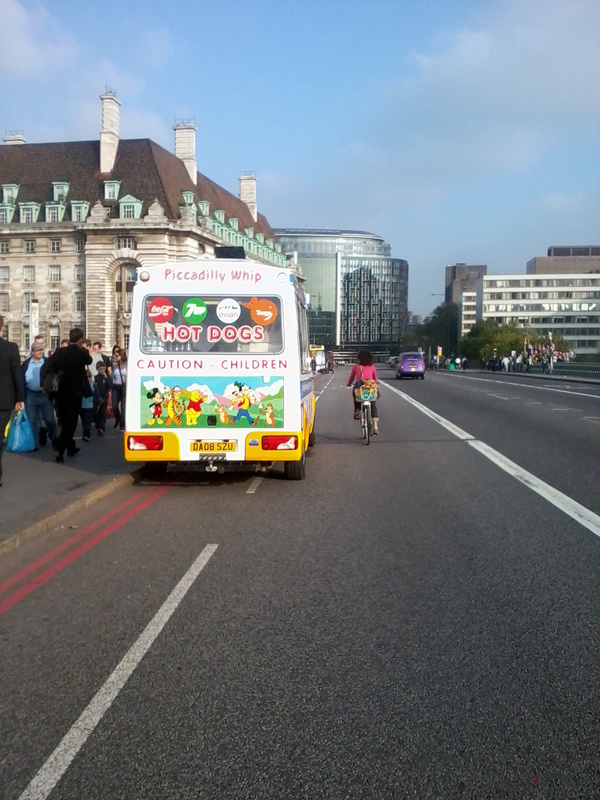 Here's a cyclist using the cycle lane, with a van in its lane, going around the corner together. Ahh, bless them. 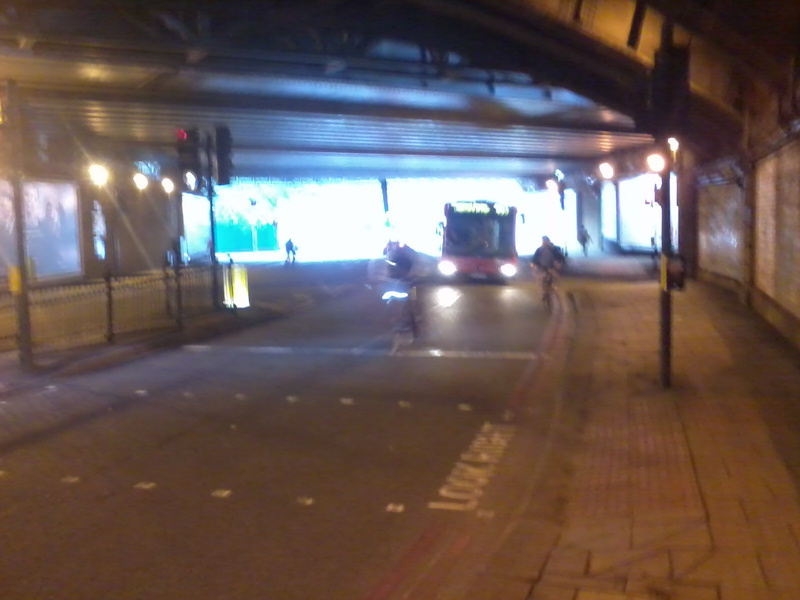 Now, to be pernickety, the lane isn't really continuous (just like a Cycling Superhighway really). 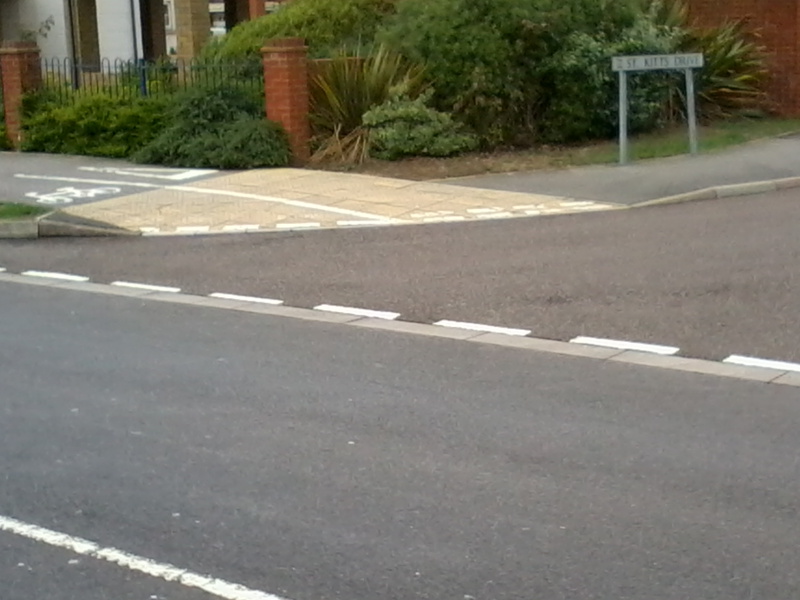 There's a tiny section, just a few feet long, where the cycle lane disappears. It's here, where the potholes are and the high edge kerbing. Funny, I didn't think cycles had enough weight over the axles to cause potholes. Now, what could cause potholes here, where the cyclist's flow line is, in this incy-wincy distance between mandatory cycle lanes? Maybe one of these going round that corner could cause a little bit of damage? So, either TfL could seriously attempt to help cyclists at this crucial point (eg having a segregated lane), or they could ignore the issue save an attempt to limit their legal liability by carefully not painting a white line for a few feet. Here it's clearly the latter. The borough's Transport Local Implementation Plan (LIP) is a crucial plan to check. It's about what transport stuff is planned over the next few years in some kind of accordance with the Mayor of London's Transport Strategy. While I'm certain that Lambeth's will be more cycling friendly than, say, Westminster's or Barnet's, that most certainly doesn't mean to say we needn't bother to get involved in the consultation process - and I hope that this revised timetable still allows good time to digest and comment. 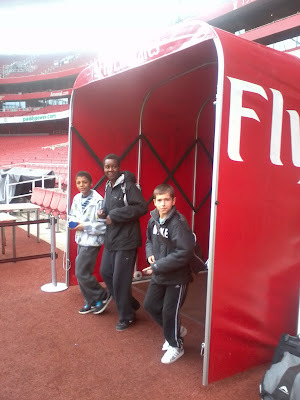 our LIP in January 2011. TfL and the public at the same time. The LIP will be made readily available on the internet. 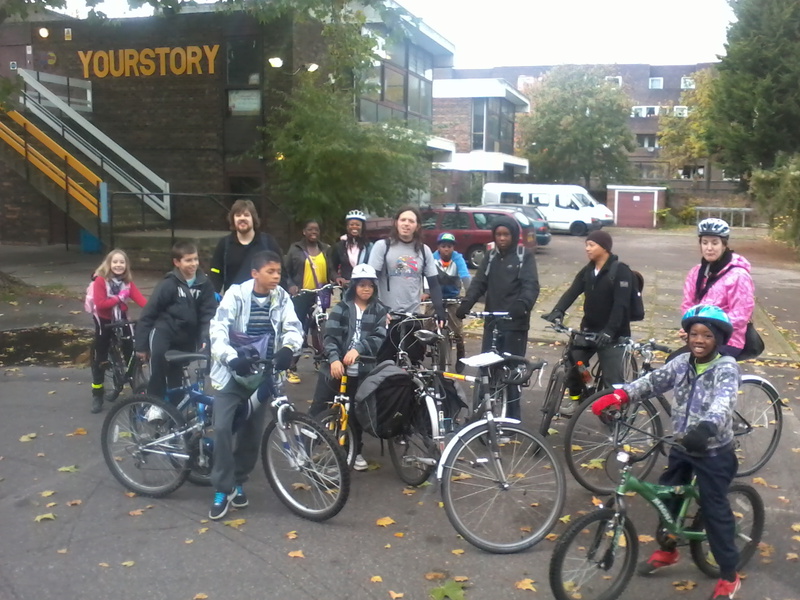 Pedal Power Kennington was recently offered a few old bikes, and some bits, by the office on a Lambeth estate if we could arrange a van and we said, "yes please"! 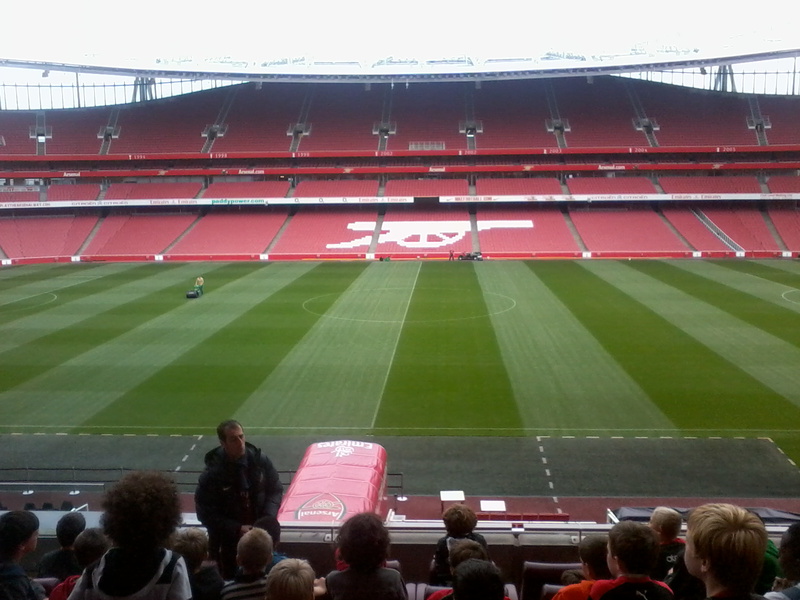 Jake, our contact, went to sort out the bits with the caretaker. He assembled the items he had in mind, then the caretaker said to him, "Don't you want the ones in that garage too?". Jake knew nothing about some bikes in a garage....so the door was opened....and the garage was piled high with bikes! So we're set up for a while with bikes for local primary and secondary school children who don't have one. 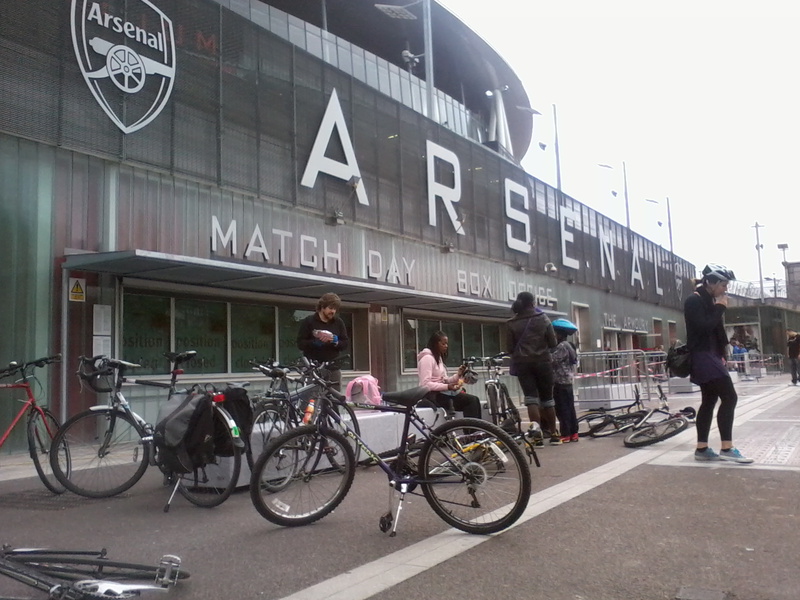 We have a secret store packed with 3 piles of bikes (goodish condition, strip for parts, maybe worth fixing or maybe parts) - from a quick appraisal we hope to be able to give about 50 out to local primary and secondary school children over the rest of term (probably after some have been loaned to people wishing to join our ride to Arsenal on the 28th October!). It is the nature of community workshops for young people that someone undertakes an action they later regret. The next day, upon reflection, they realise the impact that this has on their friends in the community and apologies are given and amends made. 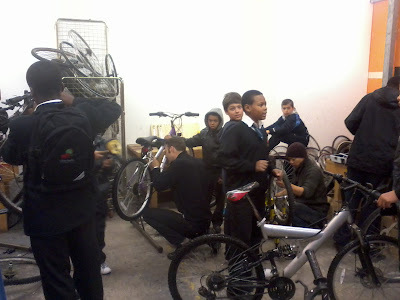 Monday night's workshop saw a number of tools disappear from the Pedal Power Kennington project, and today saw a young man contritely apologising for his behaviour with a promise to return the tools that he had taken. 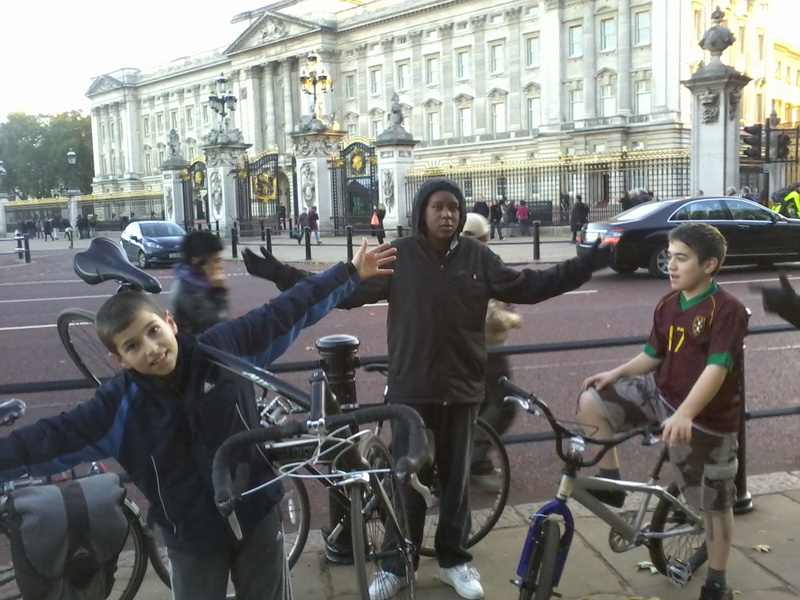 We're pleased to have him back as a member of the Pedal Power Kennington Community. Earlier today, by coincidence, a different chancer tried to make off with some tools I had left lying half-in and half-out of a bag to one side of a playground. 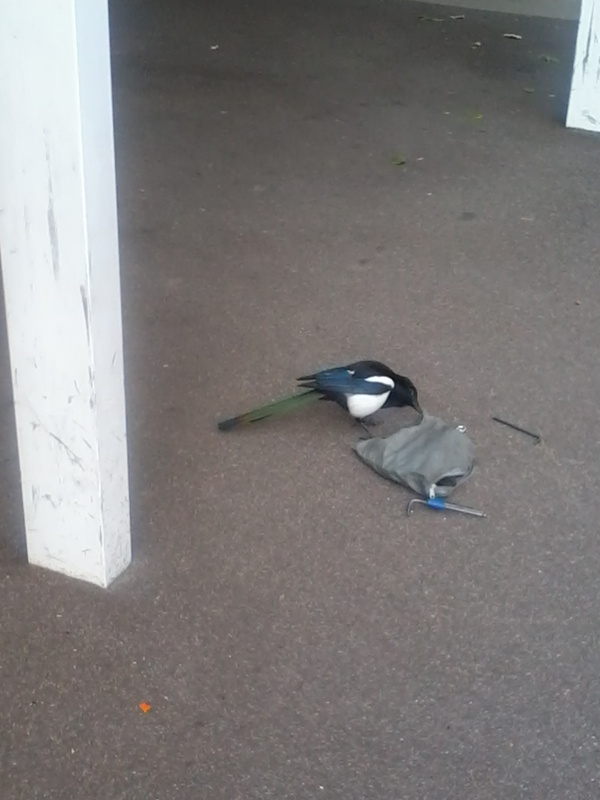 I was distracted, teaching primary school children, but they alerted me to the presence of the thief. I gave chase and luckily managed to stop the culprit making off with the shiny gadgets he was after. 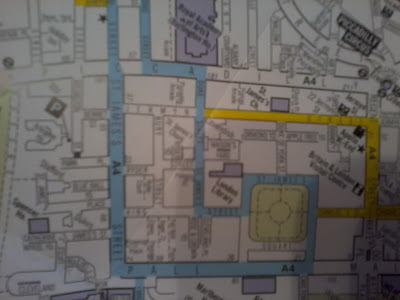 In contrast to TfL's paper promises, the latest informative copy of Lambeth Council's Lambeth Life includes statutory notices stating that Aveline Street, Brangton Road, Frazier Street, Glasshouse Walk, Juxon Street, Newburn Street, Orsett Street and Wynard Terrace in Kennington are to be two-way for cyclists. 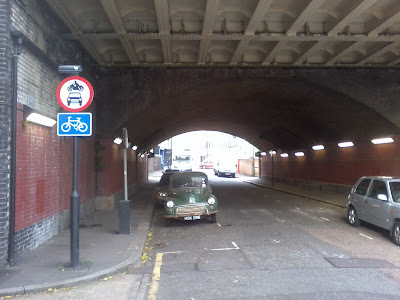 Pleasingly another Statutory Notice announces the intention to make Vauxhall Walk two-way for cyclists too (between Black Prince Road and Glasshouse Walk). 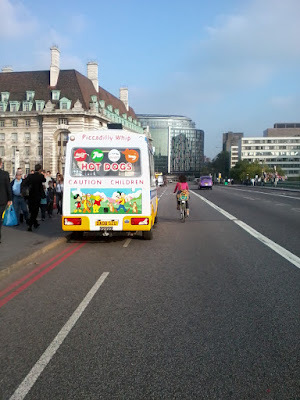 In the absence of authorative action from the authorities over ten years, I've been mulling over more effective ways than parking tickets to get rid of the Ice Cream criminals from the bus lane/cycle lane/red route on Westminster Bridge. The vans were, of course, there again this afternoon as I passed. 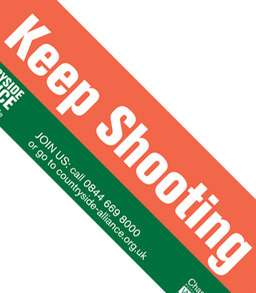 Kate Hoey, MP for Vauxhall, is the Chairman of the Countryside Alliance (pro fox-hunting etc.) 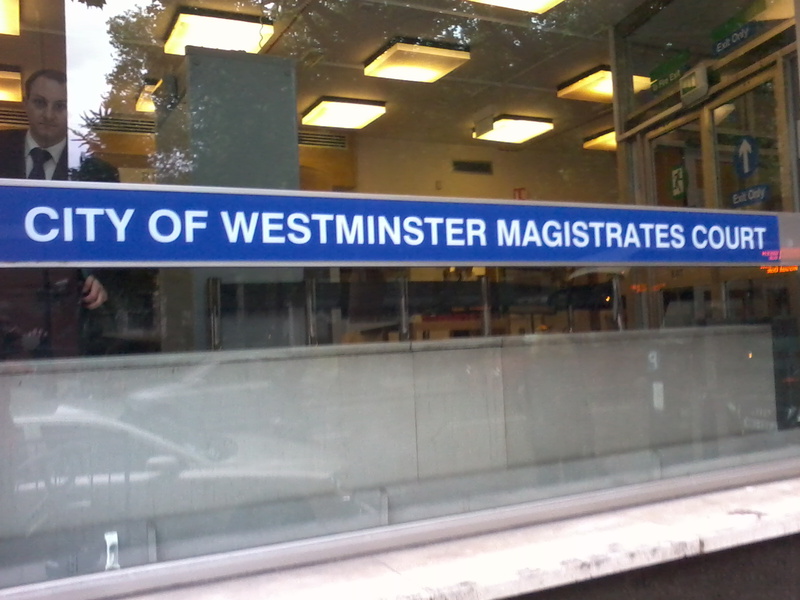 headquartered in Kennington Road. The Alliance has a wide range of campaigning merchandise and I wonder whether our local MP could be persuaded to donate some of their car stickers for some campaigners to sneakily affix all over the ice-cream vans. Given that Westminster is a high security zone there must be a chance of some trigger-happy officials riddling these vans. TfL have updated their Cycling Guides (aka Maps) for 2010/11 and the one entitled 'Cycling in Central London' (aka cycling for Boris biking tourists) omits to show that one or two streets, oh alright, VERY MANY streets in this area are one-way. c) TfL daftly didn't ask local London Cycling Campaign groups to review the maps at the draft stage. I hope that b) is the correct answer, but my money's on c). 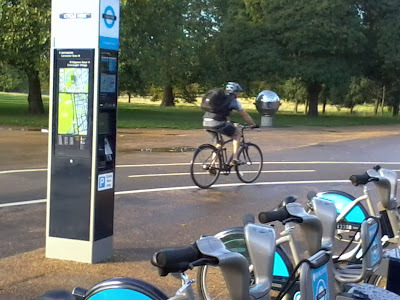 Cycling from Kennington to Earl's Court Exhibition Centre would be the stuff of nightmares for many, but a quick check of TfL's Local Cycling Guide no.7 reveals that for much of the journey there's an off-road and scenic route. Pedal Power Kennington had a great ride on it in the sun today to visit the Cycle Show. Nip over the river at Lambeth Bridge, down John Islip Street and Lupus Street, and you can cycle on the shared use pavement along the Chelsea Embankment and Cheyne Walk. On one side you have the river, views of Battersea Park and houseboats. On the other you have the mass of queueing cars that you're meandering past. 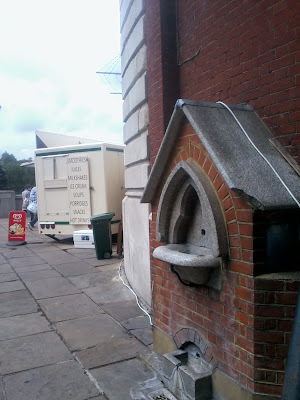 On to back streets for a quick look at the antique shops and auction houses in Lots Road before nipping across Kings Road and Fulham Road to cycle up through the wonderfully atmostpheric Brompton Cemetery (above) to the back entrance of Earl's Court. There is one little fly in the ointment on the riverside Embankment, which is part of National Cycle Network 4 (like the M4 but with a total budget equivalent to less than a foot of the motorway). 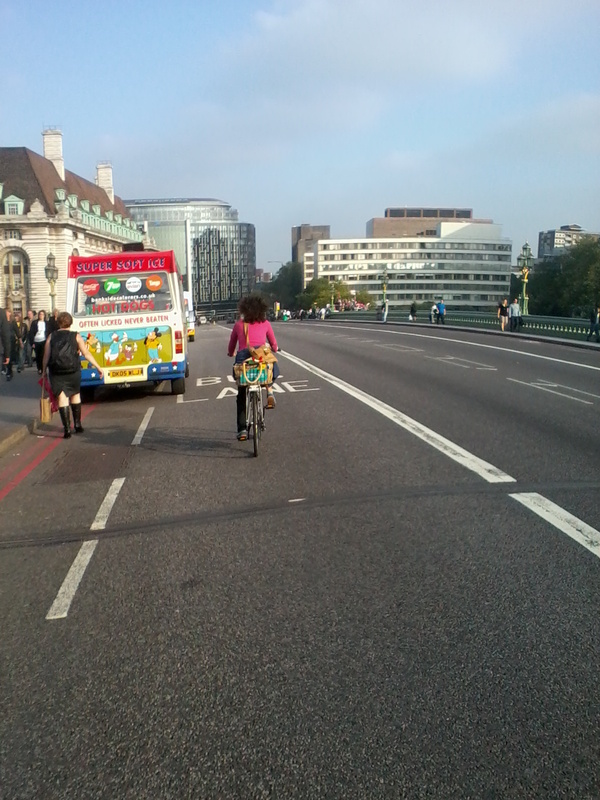 Crossing the road leading to Chelsea Bridge is a doddle due to a Toucan crossing; likewise Albert Bridge. 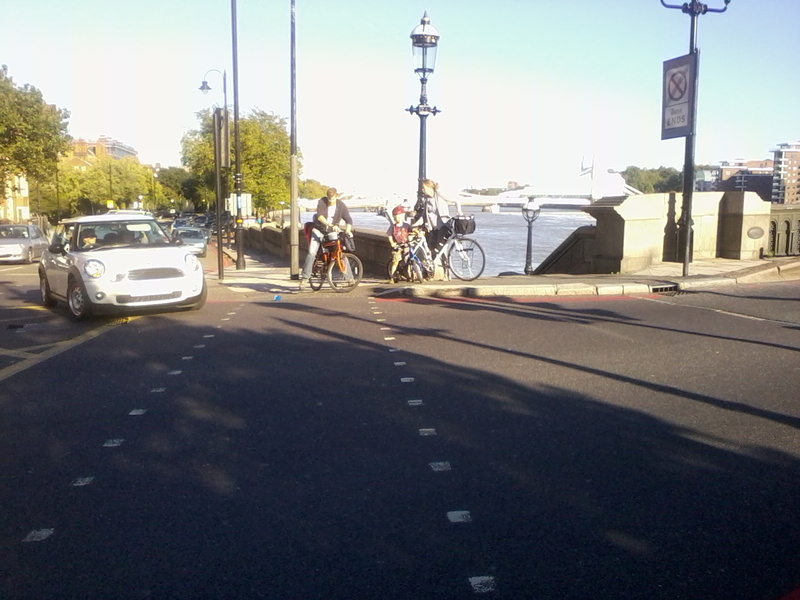 However at Battersea Bridge the powers that be have decided no pedestrian or cycle crossing lights or crossing time is necessary. So you stand there while traffic goes straight on over the bridge, then the lights change and traffic turns left over the bridge, etc. etc. After observing this a few times you take a deep breath and just chuck a couple of the smaller kids into the way of the cars. 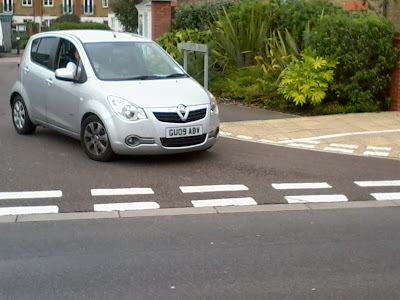 The drivers beep at them getting in their way but, 'cause they're kids, squeal to a stop. While they're in chaos you get the rest of the group to go across. Simples, innit. 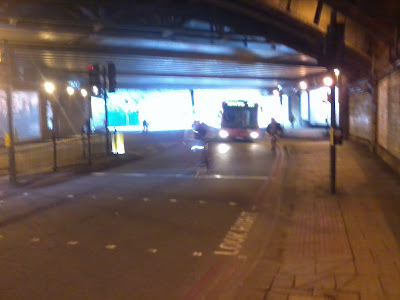 A Kennington cyclist recently told me how much she dreaded going into the dark chasm below the Waterloo and former Eurostar lines on Westminster Bridge Road. Like her I hate this sudden change from light to stygian gloom and the panicky feeling that one day a driver coming out of the light on the multi-lane chicane will run straight into the back of you. To maintain the suspense Transport for London have arranged things so you normally have to spend a dark minute nervously waiting for the traffic lights in the tunnel to change while taking deep breaths of taxi exhaust. 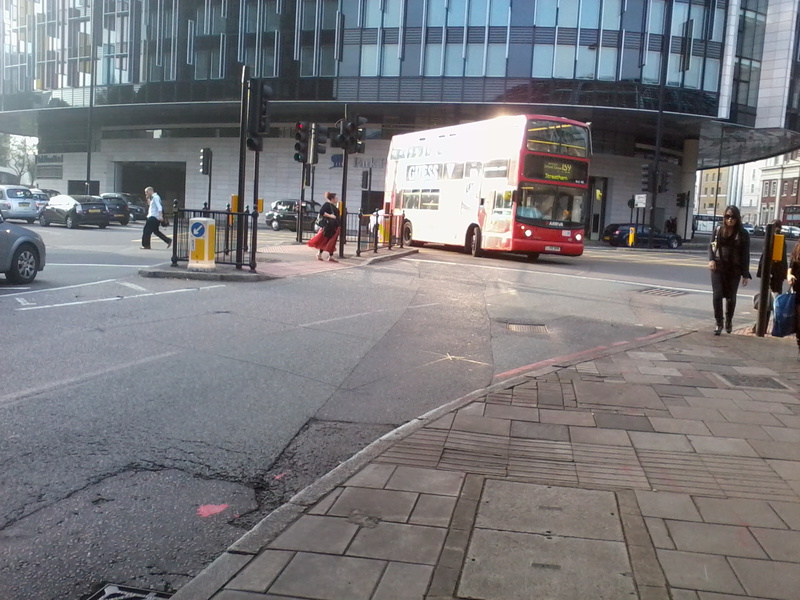 As you set off you realise you need to move out to the 'fast' lane if you're not going to spend more long minutes of your life breathing diesel particulates while stuck behind a bus at one of London's foulest bus stops. 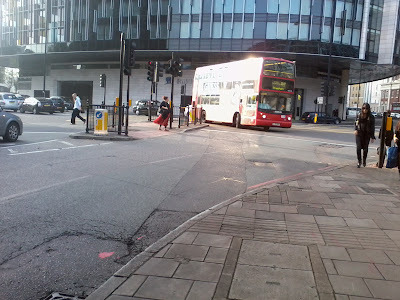 Transport for London and the rail companies (the overlying cause of the gloom) should be ashamed of themselves for creating such an unpleasant environment for cyclists and pedestrians and not resolving it. 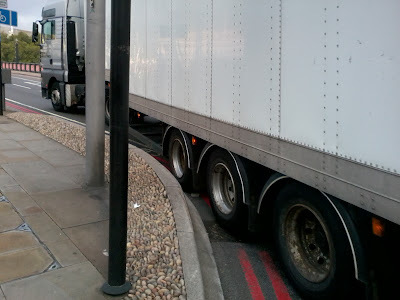 Bizarrely The South Bank Employers Group didn't mention this horror in their draft Cycling Strategy, despite (or maybe because) Netwonk Rail being a member. This is the kind of dire infrastructure that puts people off active travel and results in hospital admissions for heart disease and obesity surgery. 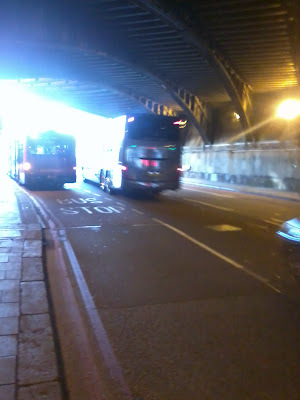 Given that the tunnel is adjacent to St Thomas' Hospital I hope that the Guys and St Thomas' Trust (another member of SBEG) are actively campaigning for improvements. Then again, the lack of reference to this in the thick draft strategy they helped write suggests they're not. Naybe they're scared active travel will put their fat cat consultants out of work and out of their Mercedes? Most likely though, as the largest employer nearby with a particular duty of care to the residents, they just don't consider it any of their business. I hadn't realised there were so many Road Safety conferences, award ceremonies and the like - with three in the near future being just a short cycle from Kennington. Unfortunately none I've looked at do anything to encourage people to travel to the event by bicycle. I guess cyclists are just not the Road Safety brigade's target audience (ooh, how the organisers must shudder of the perceived risk of a cyclist being in collision with a particulate-poisoned, obese, diabetic, stroke-awaiting, airbag-cushioned driver). Please be advised that it is quicker and easier to travel here using public transport. The Centre is within easy reach of the A1, M1, M25, M11, M40, M4, M3, M2 and M23. To plan your journey by road, visit www.theaa.com (enter the postcode SW1P 3EE as your destination). There is no car parking at the Centre however there are four public car parks nearby, for more information about car parking, visit www.ncp.co.uk. 23rd November: Parliamentary Advisory Council for Transport Safety (PACTS) 21st Westminster Lecture on Transport Safety - Roads, casualties and public health: the open sewers of the 21st century? 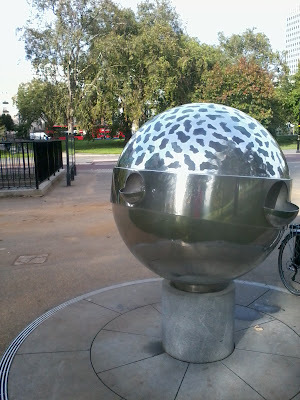 One Birdcage Walk is a 5 minute walk from Westminster or St James's Park tube stations. The venue is conveniently located 15 minutes from major overland stations Victoria and Waterloo. The Hotel is located right in the heart of England with free on-site parking for 650 cars. but then again maybe I won't. 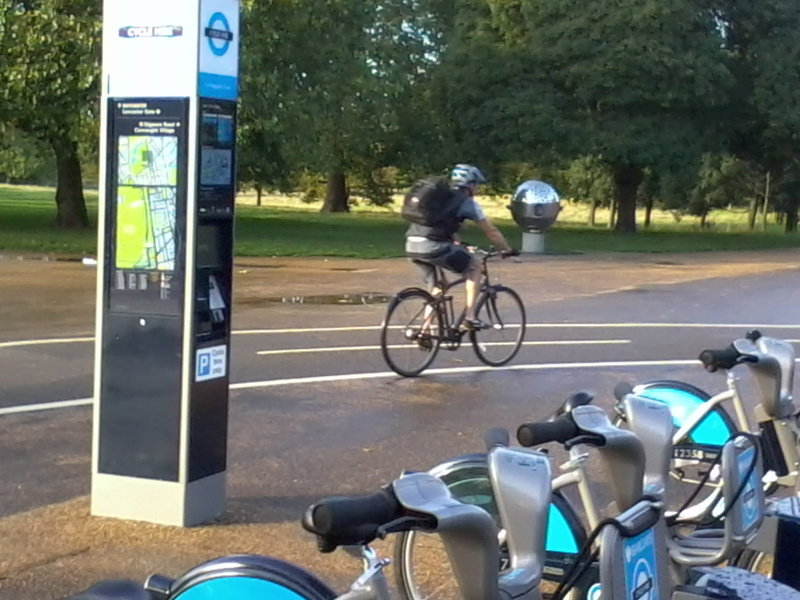 According to the draft South Bank Cycling Strategy the South Bank attracts 17,000,000 visitors a year. That's a lot of people who are likely to be thirsty during their visit. 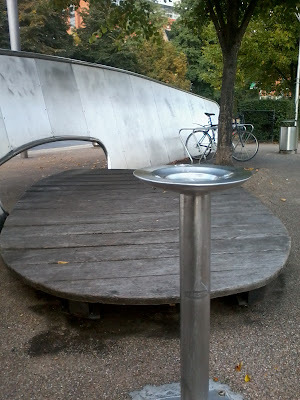 The riders on the Pedal Power Kennington ride on Wednesday felt thirsty by the time we reached Bernie Spain gardens so we stopped for a drink from the water fountain but it was broken. 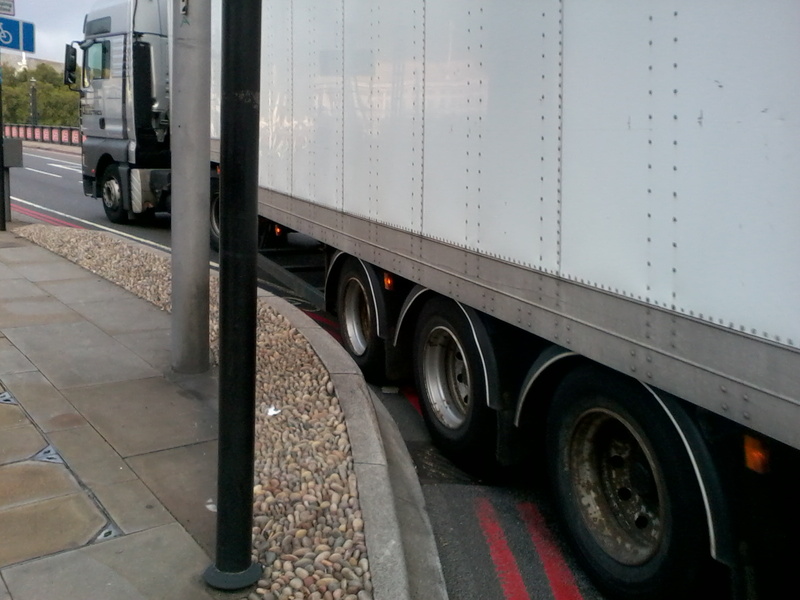 So, one of the marshalls nipped off and bought a bottle of water that had been driven to the South Bank by a great big polluting lorry. 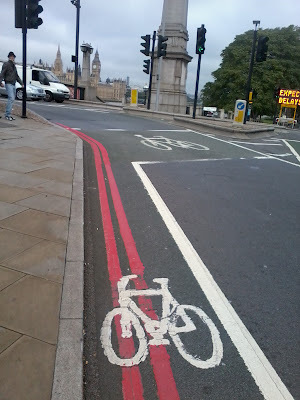 Central London's bridges are complete crap for cyclists yet London's traffic authorities have an astounding disinterest in improving conditions. Transport for London and the Metropolitan Police's incompetence cannot be shown more simply than their failure to stop the blatant day-in, day-out trading by the same ice-cream criminals in the red route, bus lane and cycle lane on Westminster Bridge.